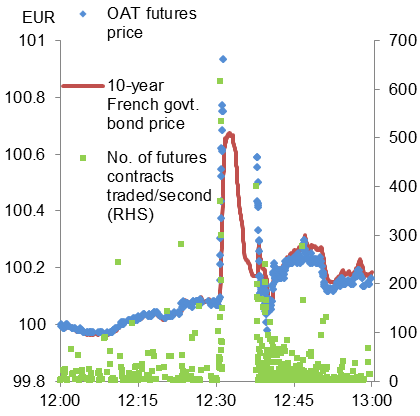 At 12:30:00 GMT, OAT futures prices, which move inversely to the yield, rose sharply – both in absolute terms and relative to close substitutes. This coincided with a sharp increase in trading volume, although no single trade was unusually large. After 83 seconds, trading on the futures exchange was automatically halted in response to the volatility – but the moves continued in the cash market. By the time the futures exchange reopened, prices in the cash market had already retraced much of the move. But market liquidity, as measured by the price impact of individual trades, remained impaired for a period of around 10 minutes. There was no consensus on the cause amongst market participants who the Bank spoke to during its market intelligence gathering. Some pointed to an unwind of crowded short positioning in OAT futures – similar to the October 2014 US Treasury ‘flash rally’. And a handful suggested that ‘news-reading’ algorithms may have played a role. This was a standalone event, with no apparent lasting impact on market functioning or broader spillovers. However, alongside the sterling ‘flash event’, and the similar events in US equities and US Treasuries within the last three years, it provides further evidence of the apparent vulnerability of these traditionally deep and liquid markets. Gosia Goralczyk works in the Bank’s Foreign Exchange Division.